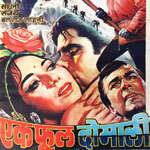 "Ek Phool Do Mali" is a 1969 hindi film which has Sanjay Khan, Sadhana, Balraj Sahni, Bobby, Durga Khote, Brahmachari, David, Shabnam, Manorama, Shyam Kumar, Nazir Kashmiri, Uma Dutt, Abu Baker, Vijay, Sultan, Manzoor, Darshan, Dubey, Kuthiravattam Pappu, Yasmin, Razia, Ajay Goel, Jyotin Goel and Sunil Goel in lead roles. We have 6 songs lyrics and 6 video songs of Ek Phool Do Mali. Ravi has composed its music. Manna Dey, Mohammad Rafi, Asha Bhosle and Ravi have sung these songs while Prem Dhawan and Ravi have penned its lyrics.